Pio XI, also known as Brüggen Glacier, in commemoration of the German- Chilean geologist Johannes Brüggen Messtorff, is located at Bernardo O'Higgins National Park, XII Region of Magallanes, the southernmost region of Chile. Pio XI is part of the Southern Ice Field, a large mass of continental ice, the third largest in size after Antarctica and Greenland. Without considering those of the White Continent, Pio XI with its almost 1300 Km.2 is the largest glacier in the Southern half of the Globe. Another outstanding feature of this huge glacial field is that, unlike what happens with most glaciers in the World, Pio XI (or Brüggen Glacier) has experienced an important progress in recent decades. Among the theories that support its unusual growth, it is said that it should be due to the special topographical characteristics that make it very stable and a long season of solid precipitations. Currently, it has a length of 64 km, a front of 6 km and its towers reach a height of 70 - 80 meters above sea level. In 1945 Alberto de Agostini visited the place and narrated the story of a Norwegian settler who tried to establish a "Estancia" (Ranch) at the head of the Eyre fjord in 1926, but had to leave the area because of the rapid advance of Pio XI glacier. According to reports of glaciology, in the 90s the force of the frozen mass generated a new lake, and the ice advanced directly on the forest, around the glacier, the dead trees accumulated and were crushed by the ice. 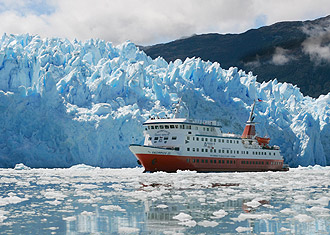 79 percent of the glaciers existing in South America are located in Chile, most of which are in the Southern Ice Field. Southern Ice Field has a length of 350 km. and an area of 16800 km.2 of which 85% belongs to Chile and the rest to Argentina. Pio XI is the largest of the 49 main glaciers that form Southern Ice Field. There is a mountain/ cold climate, the temperatures are lower than 0º C., precipitations exceed 2000 mm a year and are generally in the form of snow. From October to March are the acceptable months to go on a trip to Pio XI Glacier. Although so far little promoted as a tourist attraction in Chile because of its remoteness, this glacial mass really represents a great spectacle due to its large size, shaded ice and the impressive view that constitutes the icebergs calving.